Reporters Without Borders (RSF) calls on the Malaysian authorities to drop all charges against Zulkifli Anwar Ulhaque, the cartoonist better known as Zunar, and to stop using the country’s Sedition Act to threaten and intimidate him and other journalists. Zunar has been arrested twice in recent weeks and faces further police interrogation on 30 December. His latest arrest was on 17 December, when police raided a fundraising event he had organized in Kuala Lumpur to compensate for the losses resulting from the seizure of 20 of his cartoons in November. The police seized more than 1,000 pounds in cash on 17 December. Zunar estimates his combined losses from the two seizures – the cash and the cartoons – at 20,000 dollars. He is well known for cartoons criticizing government corruption and abuse of authority. During the 17 December raid, the police also arrested two of Zunar’s assistants and two people who had come to give him support. Zunar said there were all taken to a police station where a formal investigation was opened for violating article 124 of the penal code (endangering parliamentary democracy). In an email sent to various organizations, Zunar said he was questioned for six hours and was then released on bail and told to report to the police again on 30 December for further questioning. According to Zunar, the police plan to ban all of his cartoon books. Zunar was previously arrested under the Sedition Act on 25 November in the northern city of George Town, where he was forced to cancel an exhibition of his cartoons at a literary festival and 20 cartoons were seized. “We call for the immediate and unconditional withdrawal of all charges against this cartoonist and we urge the Malaysian authorities to stop using the Sedition Act to intimidate and threaten journalists,” RSF editor-in-chief Virginie Dangles said. Zunar has been jailed twice under the Sedition Act, in September 2010 and February 2015, and was charged with another nine violations of the Sedition Act in April 2015 in connection with nine tweets critical of the government. According to his lawyer, he is facing up to 43 years in prison. Because of his cartoons, he has also been banned from leaving Malaysia since October. Malaysia is ranked 147th out of 180 countries in RSF’s 2016 World Press Freedom Index. 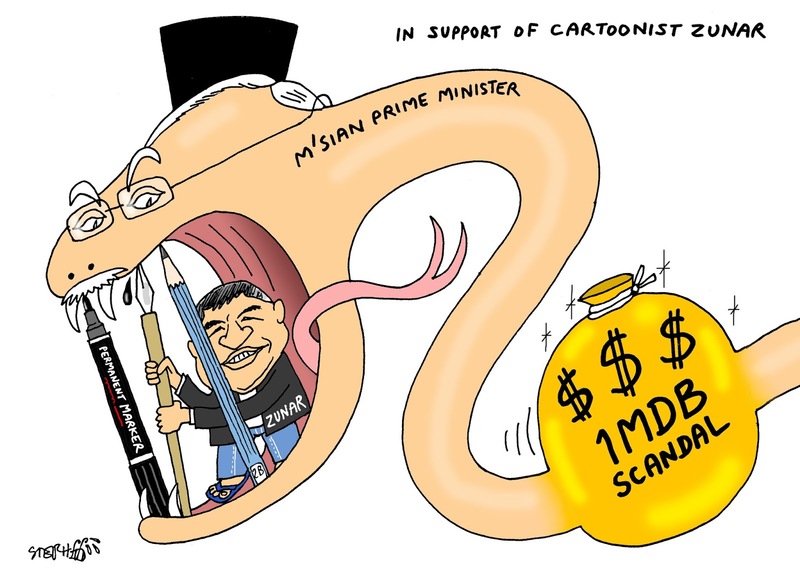 Stephff's cartoon to support his colleague Zunar, who had broached in his drawings the topic of the 1MDB scandal, in which the Prime Minister Najib could be involved. Billions of dollars may have been diverted from 1 Malaysia Development Berhad's investment fund (1MDB).